What. A. Game. 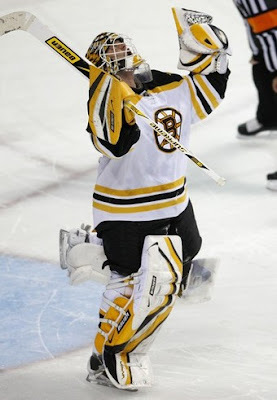 Didn't watch the Ruoah retirement ceremony, but he did help win bourque a stanley cup. But it's not 2001 anymore. "There was no way it was going to happen," said coach Claude Julien, who had, before the game, forbidden Lucic from fighting Laraque. 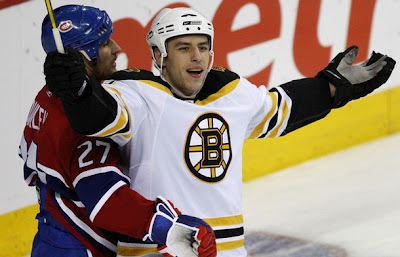 "[Shawn]Thornton was there, ready for Georges. Nothing happened. My tough guy was ready for their tough guy. Simple as that. I told him not to fight. It was me." from boston.com. Claude knows he needs to be scoring those goals. Before the game it was Patrick Roy night. Carey Price helped him raise the banner. No video of that. Whole first period is some hitting, some skating around, and some saves. Thomas and Price both looked solid. 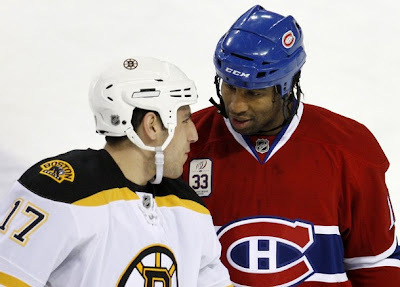 Georges Laraque was told by Coach Guy to fight Lucic. 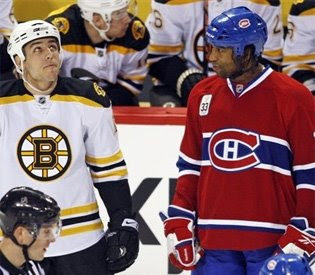 Lucic was told by Coach Julien to not fight Laraque. It got a little awkward. That was most of the first. Second period, the habs are allowed to keep it in the zone, pass it around and tip it past Thomas. 0-1. Then a little less than 10 minutes laters, Kessel makes a break for it. He manages to get around his defenseman, then puts one on Lucic's stick for the goal. Habs are annoyed. No scoring for the rest of the second. Third Period. It's one-one nearly through half of the third, until Krejci gets another breakaway, and then makes another good move like the night before. krejci brings the puck halfway into the zone, then moves it over to Hunwick (HUNWICK?) in the high slot. Hunwick gets the biscuit to the basket. 2-1. You have that feeling like, "I hope we hold on"
Our defense has been a joke when leading in the third recently, so the bruins let the habs score another one with three minutes left by tipping it past Thomas again. OT speeds by and nobody wins there. Shootout time. Blake wheeler comes out first. Keeps moving his stick around it like it's a shell game. Carey Price loses track of the 6 of diamonds. Goal. Thomas saves all 3 shots, Price doesn't TOTALLY disgrace Roy and stops the other two. "To come in here and come out with a win is really good, especially in a shootout," said Thomas, who didn't see any of Roy's pre-game ceremony. "I've seen Saku score on that last shot and him the one walking off the ice with his arms raised and all happy, and I was happy to be the one with my arms raised and happy today."